As seen in our previous posts Diabetes Mellitus can have a vital effect on the lower limbs causing neuropathy, which is the reduction in protective sensation at the feet and lower limbs. 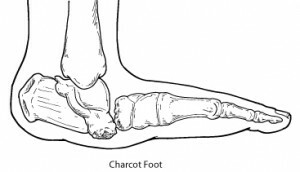 Charcot neuropathic osteoarthropathy, or commonly known as Charcot foot syndrome is a serious, possibly limb threatening complication that is associated with Diabetes Mellitus. It is most commonly linked with the presence of neuropathy at the limbs. It is characterized by inflammation and joint disorganization due to the presence of neuropathy, trauma, metabolic abnormalities of the bone and other component factors. The presence of inflammation leads to bone destruction to various degrees, dislocation and deformity. 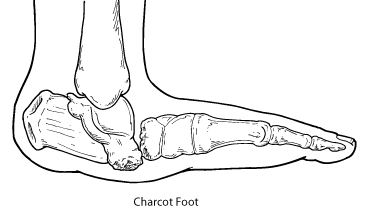 The most common deformity that is associated with Charcot foot is the collapse of the mid-foot, causing what is described to be a “rocker-bottom” foot as shown below. However, any joint in the foot may be affected, causing other deformities in the area. Some of these signs described above may present subtly. Thus diagnostic imaging may be considered to aid with diagnosis. Treatment generally requires offloading the foot, aiming to reduce the chances of attaining pressure ulcers, any bone diseases and to prevent further fractures at the bony prominences. This may be performed by wearing therapeutic footwear, orthoses, orthotic walkers etc. Surgery options are also suggested. Treatments methods are subjective to individual cases and are based on expert opinions. Thus may vary between individuals. For further discussion, do book in to speak with your friendly podiatrist.